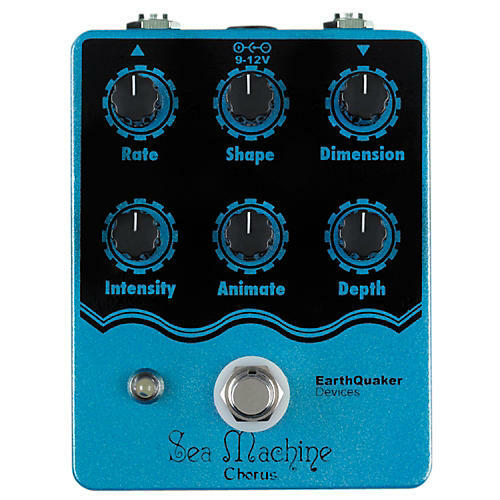 The Sea Machine is a chorus pedal with ultimate control over parameters rarely, if ever, seen in a chorus before. A hybrid of digital and analog circuitry with a slightly extended delay time allows it to really stand out and shimmer. Subtle warble, classic leslie, sea sick pitch bends, strangled aliens, stunted arpeggiations¦ there is something for everyone in the Sea Machine. Designed to work well following fuzz, distortion or overdrive without getting muddy, loss of volume or breaking up (the Sea Machine has excellent headroom at both 9 & 12 volts). When engaged, the transparent buffer leaves the all analog dry signal unaltered and crystal clear. It can be powered from 9-12v DC, higher voltage yields a more intense modulation, slightly longer delay time with more chime and dimension. The Sea Machine is true bypass and made by human hands with the highest quality parts in lovely Akron Ohio. Rate: Speed of the LFO. ¢ Shape: From soft triangle through hard square wave. Animate: How far the pitch shifted signal swings, lower levels equals a tighter and more focused shift la traditional chorus. As you increase the control a more wild and animated pitch shift begins to emerge. Power: Any standard regulated 9-12 volt power supply with a negative center 2.1mm barrel. Do not run at higher voltages! Does not use batteries. Current draw is around 100ma.